The Harder They Come is based on Perry Henzells' 1972 cult movie of the same name, and it is the story of a country boy Ivan, who moves to Kingston, Jamaica, to pursue his dreams of making a record and making it big. Lucky in love but not so much in life, Ivan falls for Elsa, the adopted daughter of an overzealous preacher (Victor Romero Evans). With the relationship forbidden by Elsa’s guardian, the pair find themselves cast out and with no means of survival, Ivan turns to selling Marijuana for the splif toting Pedro (Marlon King). Soon, he discovers the notoriety he craves but for all the wrong reasons; he shoots two policemen and becomes a wanted man. This play, also penned by the late Henzell, has an affinity with the movie not often found in stage adaptations. The set and the costumes were simple but authentic, and the patois is not too difficult as to alienate the non Jamaicans in the audience. Matt Henry as Ivan, has the swagger, the voice and the moves. The relationship between the music and plot is symbiotic; the music is there to tell the story as much as the dialogue and it stays with the plot throughout. 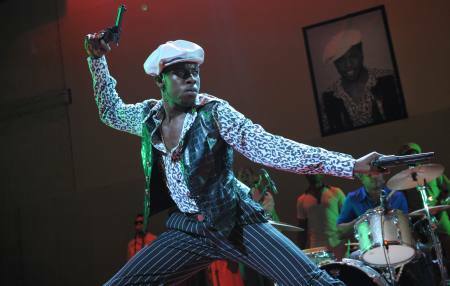 The soul and passion evoked by all of the performers in the songs is a testament to their talent and an unexpected soul-lifting rendition of Rivers of Babylon from Pedro (Marlon King), invited woops of joy from the audience. With a full reggae band and a pulsating soundtrack taken from the original movie, the music was definitely the highlight of the evening. Renditions of "You can get it if you really want," "Sitting in Limbo," "Johnny Too Bad" and "The rivers of Babylon" had the audience swaying in their seats and there's of course, the title track "The Harder They Come." By the end, the audience could not resist the urge to burst from their seats and dance in the aisles as the cast played out. This is one of the best shows I have seen on stage!